So I guess this is the time of year that people visit their friends. (when are you coming to visit me??) Sandra, my Spanish floormate, had her friend Silvia over for a couple days. 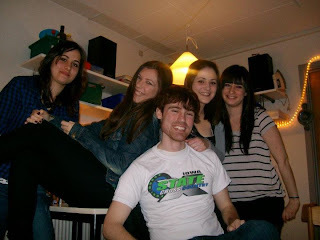 Silvia is also from Spain but is actually studying in Germany. So Thursday I hung out with the Spanish girls (Sandra, Maria, and Laura) and Silvia as well as Juan, Carlos, and some of their other Spanish friends for a pre-party before going out to A-Bar. There I tried Jaegerbombs for the first time and I have to say they are definitely my favorite thing on the planet now which surprised me as I hate the two ingredients (Jaeger and Redbull) separately. But somehow together they are amazing. Conversations with Silvia were awesome and interesting because every third or fourth sentence included a German word (on accident!). She said she actually struggled to speak Spanish with the people here because she has been in Germany so long speaking German. Saturday was quite the experience and my first time partying with my Danish floormates. Odense was celebrating "Fastelavn", kind of a silly spring halloween. All I know is that it is an excuse to dress up in a costume and have fun. Wikipedia is better at explaining things than I am, so here is an excerpt from the article: Traditional events include slå katten af tønden ("hit the cat out of the barrel"), which is somewhat similar to using a piñata. The Danes use a wooden barrel, which is full of candy and sometimes oranges and has the image of a cat on it. Historically there was a real black cat in the barrel, and beating the barrel was superstitiously considered a safeguard against evil. After the candy pours out, the game continues until the entire barrel is broken. The one who knocks down the bottom of the barrel (making all the candy spill out) becomes kattedronning ("queen of cats"); the one who knocks down the last piece of the barrel becomes kattekonge ("king of cats"). So I dressed up as a cowboy borrowing a plaid shirt, handkerchief, and cowboy hat from Julius on my floor. One couple on my floor was dressed as a police woman and a prisoner, another like two Waldos, and Morten was dressed as an angel with pink wings and a white toga. We started with a group meal of Tacos which were DELICIOUS! They made a lot of meat, hard shells, cheese, corn, fresh and delicious lettuce, and some other stuff including half a kilo of peppers. Bo promise to eat whatever was left of the peppers at the end...Much to his gf's dismay, he followed through on that promise and ate nearly a pound of peppers after finishing a meal of tacos. And this was BEFORE any real drinking happened. We started out by playing a fun game called "Shrek". You make a giant pitcher of a mixed drink (whatever you want, we did a 2 parts juice/soda 1 part liqour) and start out with one die and six empty shot glasses (one for each number on the die). You go around the circle rolling the die, if that glass is empty then you fill it and it is the next person's turn. If it is full, drink it and roll again. If you fill the last glass or empty the last glass, then you have to drink all 6 (and then roll to see which glass to fill). It is really simple and fun. We were also playing rock band as well which was a blast. It had been too long since I'd played that. After I ran out of cash I tried to buy some drinks with my card but was informed that I don't have the right kind, I need one with a special chip or something. I don't really know the details and haven't had a chance to ask anybody about it yet, but I was sad. Why didn't the bank issue me that type? O well. My last post was about my "Project Work" class. Well, this weeks was no better. To recap, the first week we made paper airplanes. 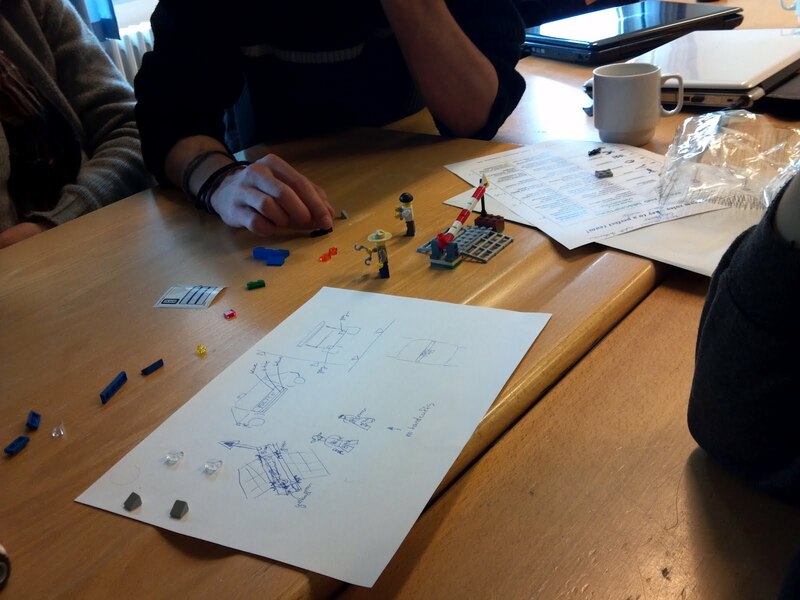 Last week we learned about "cultural awareness", this week we played with legos :P We got put in groups again and there was a completed lego scene set up outside the room. Only one of us could go look at it at a time and could take nothing with us, and once we started building it we couldn't go look anymore. It was a police car and a little barricade thing. We setup the barricade correctly, but just couldn't get the car together...the other groups did fine, but we were awful. Also, we were the first group to start building, so we were made an example of by the teacher. I guess I would rather learn that lesson now than on our project! Last friday (2/17) the university threw a HUGE Party that they called "Semesterstartfest" or something. I don't think I need to translate that for you, but it was great. There were 2000 students IN the university from around 10-2am. 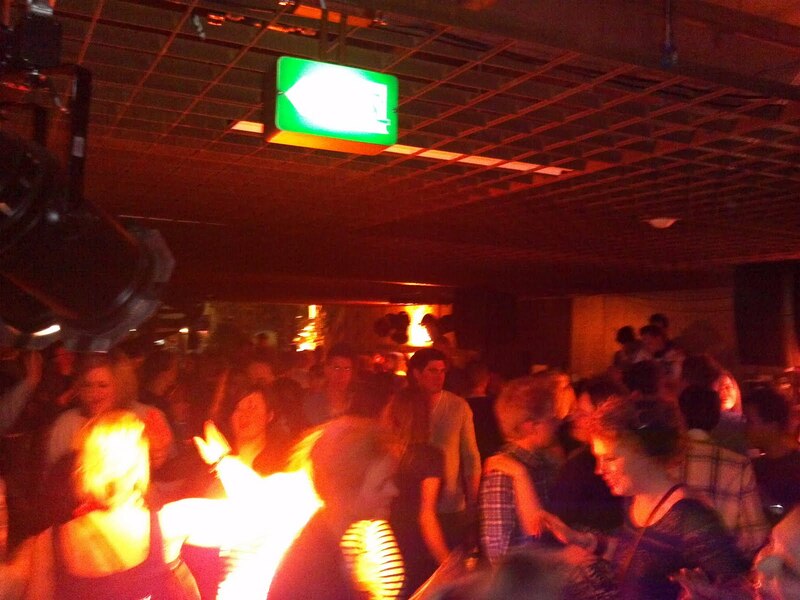 Each of the majors bars in Odense had their own locations in the building and the biggest had their DJ's playing in different spots so you could walk around and dance to the music you wanted to. 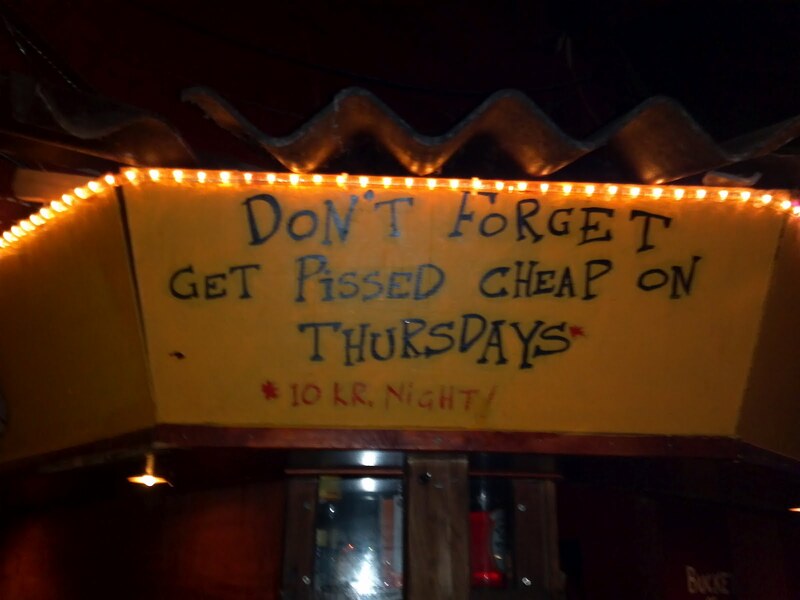 In America college students drink (shocker, i know!) but not IN the school buildings, or at least not sponsored by the school, so this was very neat! Most of the international students I talked to said that it was also new and different for them, as well, so we had a great time. By the end of the night the bars were competing very strongly with each other and were selling shots for 5dkk which equates to about 80 or 90 cents. Afterwards the official "after party" was at Club Retro which is a good 30 minute bike ride from the university. My dorm is only a 10 minute ride so I decided to call it a night (as well as the other people from my dorm) to rest up for the next day. Tuesday Feb. 21st was a "Danish Movie Night" hosted by the ESN network where we got to watch a couple of the more famous Danish movies. The first was "Worlds Apart", a true-story drama about a young devout Jehova's witness whose faith is shaken after meeting a young boy and finding out that her parents are separating due to her fathers infidelity. I really enjoyed the movie for a couple reasons. It was really great to learn a bit more about Jehova's witnesses other than that they knock on our doors. Also, it was fascinating to me to see a movie with an anti-religious message. To be fair, she wasn't a "mainstream" religion, but the boyfriend and his parents were atheists and at the end of the movie she abandoned Jehova and left her former life. It is a message that I just can't see being made into a mainstream American movie and it was done in a very tasteful way that I appreciated and agreed with. But, I think even religious people could appreciate the movie and would frown upon the intolerance that it brought to light. The second movie was called "Flickering Lights", perhaps one of the most famous Danish movies. It is described as a comedy, though imdb also has the "action" tag on it which is definitely appropriate. Perhaps a lot of the humor was lost in translation or went over my head because of cultural ignorance, but I wouldn't really describe it as a funny movie or a comedy. There were parts that were funny, as in most good movies, but not enough for me to label it a comedy. Anchorman is a comedy. The Hangover is a comedy. This? Not to me, but it was a good movie. One of the things I most enjoyed was the flashbacks that each of the characters experienced, showing memories of what caused their particular psychosis or issue and also how they met. There is a scene that we were shown at our orientation days where the guy who is crazy about guns goes off into the woods and a cow starts looking at him wrong. He the proceeds to talk trash to the cow and ask him why he's staring at him, etc. Without context it isn't really funny, but even with context and having seen what leads up to it I didn't really laugh as much. But this is Danish humor, so here is the link: http://www.youtube.com/watch?v=B5IpVVhKrd4 That aside, I did enjoy the movie more for its story than for the humor, and would recommend it. I found out YESTERDAY (Wednesday) that some of our girl friends were going to Copenhagen today (thursday) for the weekend and that we should try to go with. Oh, and isntead of train we want to hitchhike their and instead of a hostel we want to find a free place to stay on couchsurfing.org (the girls already found one). So we looked for places, but on such short notice (and originally with 4 guys looking to go) it didn't work out. Maybe in the future we will try something like that :-) but it's ok because there is an ESN trip to Copenhagen in March that I will go on! I'll be sure to let you all know how that goes. The bathrooms in the uni are co-ed. So you get your own stall with floor to ceiling door and then the sinks are out there. It actually makes a lot of sense, in my opinion. 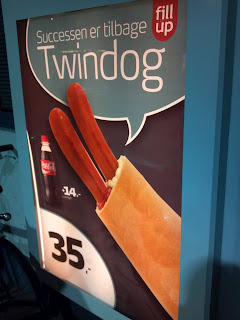 An advertisement at a gast station for their twindog. The dogs come in a bun and like so and one is surrounded by ketchup and the other by what I assume is mayo. 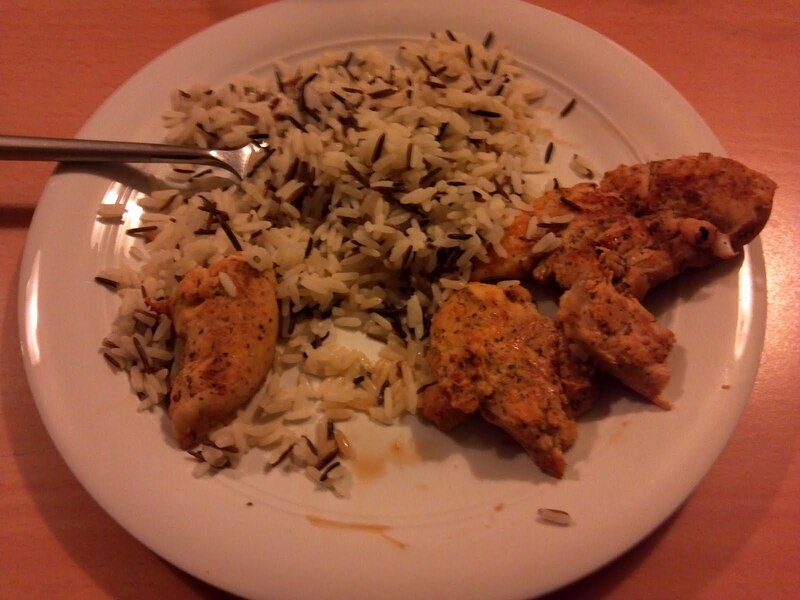 Looks good? 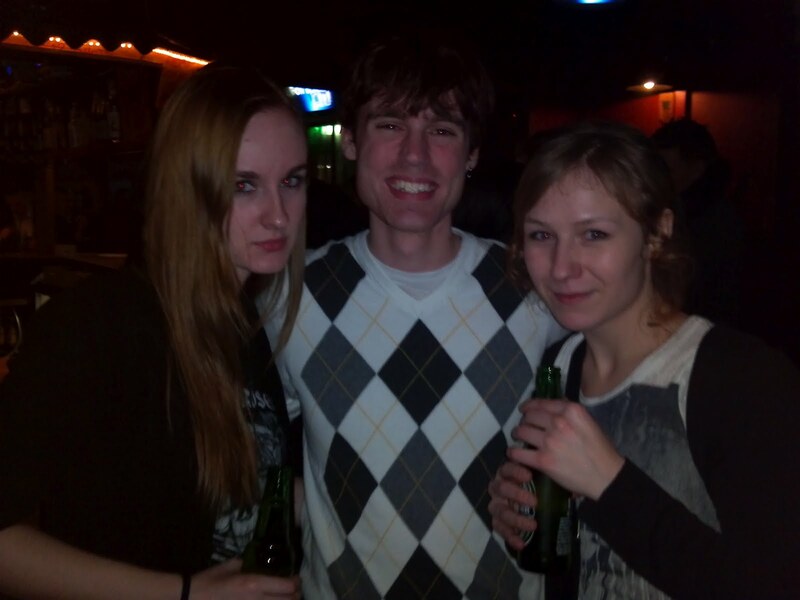 The two visiting Polish girls, it was nice to meet you! The danish ladies on my floor made some delicious Danish pastries. They are always doing things like this and, as always, it was delicious! Oh, and the hat...This weekend they are celebrating "Fastlavn", kind of like halloween, I'll explain it more in my next post. 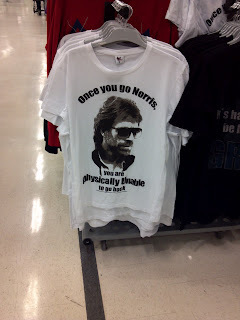 I was just walking through "Bilka" (walmart) when I found this shirt... "once you go norris, you are physically unable to go back"
Oh just a sign in A-Bar..."Don't Forget, get pissed (for) cheap on Thursdays!" Today my "project work" class was actually a seminar on cultural awareness. We broke into groups based on our country. I was the lone ranger, championing the stars and stripes for you all against large groups of Frenchman and Pollacks and other Europeans. We went over "Hofstede" dimensions which are apparently a way of viewing certain cultural traits on a spectrum. The first of which is the Power Distance. I have learned that America is a "High Power Distance" culture, and so is our education. Denmark is a "Low Power Distance" culture. As such, those with "less power" are closer to their "superiors". That means that in school students are EXPECTED to question their teachers and to disagree with them, communication/discussion/speaking up is a staple in a Danish class room, and outside of class teachers are just another equal person. Even if particular teachers or classes operate similar to that in America, the general culture is quite different. For each dimension we discussed what might happen in a certain situation. For this dimension we talked about a factory employee questioning his boss and what would happen. I guessed that in a factory it would be expected to listen to your boss and not question them. I know other jobs have a lower power distance, but I imagine personal efficacy and responsibility is also a factor as well. Many employees feel less responsible for the outcome of their work and more for just doing what their boss tells them. Other countries were similar, but Denmark it is expected that if you knew your boss was wrong you would question them. The second dimension is Individualism vs. Collectivism. But some of this was confusing..."collectivist: diploma certificates are important and displayed on wall". That is very true in America, but we are at the top of the Individualism scale. O well, I ignored this one. The case we talked about was how a marketing team in a company would use it's winnings. Would it use it all on itself for a bigger party, or invite all of their contributors to a more modest party. I said that in general the winning team would probably feel entitled to all of it, even if there were significant contributors, and would do the bigger party. But this was VERY hard to answer (as most other countries agreed) and it really does depend on the situation. In education: A feminine teacher avoids openly praising students and at the same time a failure is a relatively minor accident. Students also practice mutual solidarity and behave modestly as well as choosing to study subjects that are intrinsically interesting to them. Masculine teachers praise their students, but failing is a more major thing. Students are actively competing and not as modest and choose subjects based on career opportunities. 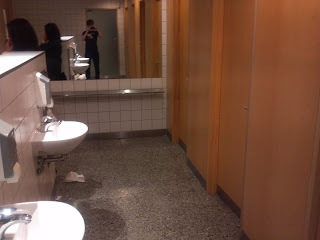 Denmark is a VERY feminine culture, at least in regards to education, whereas America is a very masculine one. Personally, I see benefits to both. Uncertainty Avoidance: the extent to which people feel threatened by uncertainty and how far they will go to avoid it. This is the last dimension we explored. The case we discussed was about a group of students with an opportunity to tour companies in a country with a very difficult language. This difficulty made it impossible to make all of their transportation/accommodation arrangements ahead of time (they would have to figure it out when they got there) causing some students to be skeptical and consider not going. What would happen and would they still have the trip? The Danes said that no, they usually pick the safe choice when it comes to big things like that. The French and Pollacks felt more adventurous and said that most would probably do it anyway, it is more about the life experience than the plan. I said that on an individual level we are more open to uncertainty and would be more likely to want to make the trip, but on an institutional level we are not. The school would not be willing to tolerate the liability associated with the uncertainty and the risks involved and we wouldn't allow it. On the educational level, weak uncertainty avoidance means "students feel comfortable in unstructured learning situations: vague objectives, broad assignments, no timetables. Teachers are allowed to say 'I don't know'. Students are rewarded for innovative approaches and teachers interpret intellectual disagreement as a stimulating exercise", but Strong uncertainty avoidance: "Students feel comfortable in structured learning situations: precise objectives, strict timetables with teachers who have all the answers. Students are rewarded for accuracy and teachers interpret intellectual disagreement as personal disloyalty". I, personally, have STRONG uncertainty avoidance. I can handle uncertainty when I need to, but I really prefer to avoid it. And I feel that culturally america lines up with stronger Uncertainty Avoidance principles in education at least. Denmark and Singapore is actually very low on the scale, so while in the case we discussed the Danes went with the safer choice, in many other areas of culture they are the opposite. Things are finally settling into a rhythm here in Odense. I have class Tuesday(my project management/teamwork class), Wednesday (Android Programming), and Friday (C#/.Net Programming) mornings 8:15-11:45. Class usually involves a bit of lecturing followed by hands on work and exercises. It also has a 15 minute break after each hour which I find odd, but then again it is a 4 hour class so I am grateful. I also have a group project that will be starting up in the week or two that will last the entire semester but doesn't have a scheduled time. Friday I went out pretty hard with my group of Polish friends and Tina from Slovenia which was fun. I did a lot of dancing and look forward to embarrassing myself to crappy american pop music (and some great 90's hits!) in Danish clubs for the next several months. Saturday I didn't feel very well, though, and not just because of the partying the night before. I had been sick for a couple days, and it peaked Saturday night. But I drank plenty of water and ate a big meal and went with Danni and Nikki to meet Kasper, a danish buddy of theirs with the same birthday as me. We got lost on the way, and it was freezing (reached a record low for that day, I believe, of around -25 Celsius) but we made it. 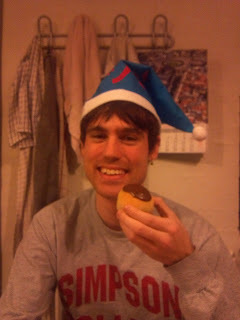 It was a bit of a bummer not being able to have a large celebration with friends and family for my "21st" birthday back in America, but my danish floormates made up for that by making me a danish birthday cake Sunday afternoon. The birthday cake actually had very little cake but had a lot of cream and a layer of bananas and macaroons. It was really interesting, and pretty good! Also, the Danes LOVE their flag. We like to think we are patriotic in America, but they seriously have them everywhere, especially for birthdays (as you will see in the pictures below). They also gave me a present!...Saltlakrids. Also known as the worst thing ever made. It is salty licorice, and of course their licorice is black licorice. They bought it as a joke knowing I would hate it, so I humored them by trying the strongest type they bought. Yeah, my reaction lived up to their expectations and I made a sour face and almost gagged. But it was a pleasant afternoon and made the sting of being away from home almost disappear. It is interesting to note that I stayed completely sober for my entire 21st birthday. And I am completely ok with that! Then yesterday (Wednesday) I helped surprise Anela for HER 21st birthday. If you'll recall, Anela helped my buddy Malu greet me when I arrived in Odense. She is leaving soon to study abroad in Spain so it was really nice to be able to thank her for welcoming me. Sandra, Maria, and Laura from Spain and Fawad, an afghani friend of Malu and Anela were also there. We ate at a place called Jensen's Bøfhus, a nice steak/burger joint. For about 20 dollars I got a nice cheeseburger (served with a DELICIOUS spicy mayo) with onion rings on it, fries (actually unlimited, they keep serving them if you eat them all), and access to the salad bar. Half of us got burgers, and the three spanish girls ordered a waffle with ice cream and chocolate sauce. The others were eating their burgers with a knife and fork, and it was too bit to easily fit in my mouth, so I tried doing that too. It was really hard and took forever, but I conquered it. Pictures below. Today I did laundry for the first time since I got here. I literally wore every piece of clothing I brought...so it was time. I went to Bilka to buy laundry detergent beforehand but accidentally brought home fabric softener. Oops...then I found out that the washers actually dispense their own detergent so it was a completely unnecessary trip to begin with. O well, I bought some groceries while I was there. That sums up most of the interesting things that happened this week. I also submitted my application to be a CA at Freddy Court and will be interviewing with them over Skype this Saturday. They said to dress business casual..well, I Guess I'll wear a sweater? Not like I brought business clothes over here. The cool thing is I can probably get away with not wearing any pants. And who doesn't have "show up to an interview without any pants" on their bucket list? I'll let you all know how it goes. Myself, Fawad, and the birthday girl! Monday morning began with a cold bike ride to the main campus at 8am, about 10 minutes away from my dorm. There I met my buddy Malu who showed me how to get my student ID and my swim card. The school pool and sauna is accessible by card in the mornings, but I doubt I will ever use it. The main campus building as a whole is actually very interesting. It is one LOOONG hallway, I'm talking like 1k+ long (a kilometer is .6 miles). It also has a "lane" down the middle that is reserved for vehicles. They have some fork-lift type things that zip around carrying things from one part of the building to the other. She then dropped me off at the auditorium where I met Danni and Nikki to listen to an introduction speech. Pretty standard. Then there was a break where coffee and tea were served. Always coffee and tea. I miss the water and lemonade that are often served in America, but o well. We then sat around waiting for the break to end and we gathered with all the Engineering students to walk over to the Engineering campus for our orientation. But first they served us lunch which was a sandwich and glass-bottle soft drinks. There were a few different choices of sandwiches including one with super tiny shrimps on it and hard boiled eggs (ew), so I opted for a roast beef one and some Pepsi Maxx(I am too scared to drink their bottled water. Idk why, it is irrational). As I removed the tomatoes from the sandwich I was pleasantly surprised to find that the sandwich had french fried onions on it! Score! It also had pickles and an interesting yellow spread that was delicious. Afterwards there we learned some cultural do's and don'ts as well as learned some more information about the engineering school. The most exciting part was getting a free cinnamon roll. After orientation, Danni and Nikki accompanied me back to my dorm to see what it was like and meet some people from my kitchen. They ended up staying and talking for an hour or two and I think they had a good time. The people in my kitchen are great people, I really lucked out. One of them is actually the president of the dorm, so that is neat. After Danni and Nikki left I did some fiddling around on the online system for school checking the school email, class registration, etc. and then went to sleep. Tuesday morning orientation was for filling out the residency permit application for EU students, something Americans should have done already (I did!) so i was able to sleep in a bit. So I woke up and got another free sandwich (the same one) and some lemonade at orientation and then attended an IT session which covered everything I did the night before...so that was a bore. But following that we got to meet a professor for our program and learn about our particular exchange program - for me that is Software Engineering. We toured some facilities and saw the group spaces we will get for our group project. That was pretty much it for the day. Wednesday was my first day of classes at SDU. I needed to sign up for one more course but I wasn't sure which I wanted: Android Programming or Game Design, the first is wednesday morning and the other is in the afternoon. So i went to both so that I could make a decision afterwards. This is the first semester that the android class is being offered at SDU and the teacher was completely unprepared and the class was a disaster...The teacher doesn't really have much experience with android programming so he has an assistant there that hopefully knows more. I wish I had more to say about the class, but it was just a wreck. My afternoon was spent in Game Design where I had a much more pleasant experience. The class was about 10 students and seems interesting, but unfortunately I think the class would be pretty useless as the focus is more on the formal elements of games (players, rules, conflicts, mechanics, design) and less on how you use programming and tools to make games. If there was a follow up course I could take, that might be worth it, but I think learning android is going to be more beneficial to me in both the short term and long term. even if the class itself doesn't get any better, I will have the book and should be able to learn sufficiently. That pretty much sums up the exciting things that happened this week. As you can tell, life here isn't that much more exciting. I really do need to get a bank account set up, though, so I can use it to buy a SIM card with internet for my phone which is shipped and on it's way. Last check it was "in transit" from Indianapolis and should be here next tuesday or so via fedex. Hopefully the delivery goes smoothly. This is short review of a camera in a Danish magazine equivalent to Maxim with a title that would NEVER fly in an American magazine: "The Perfect Camera for Michael J. Fox"
This is the delicious sandwich I had (with the gross tomatoes on the side, where they belong). I can't believe I never thought of french fried onions as a sandwich topping before this! !